Many Chinese speakers indicated that the traditional Chinese Bible, Union Version, 1919, was very hard to understand. Now there is a new version, Jian Ming Sheng Jing 簡明聖經 (hereafter JMSJ), which both adults and children enjoy reading. Another brother told us that he had been the senior scientist of an American company. Then he retired and went to teach at Shanghai, China. During that time, many people gave him Bibles of the Union Version and invited him to church. He tried to read the Bible, but couldn’t understand it. Therefore he didn’t go to church. Later a professor from the U.S. gave him a JMSJ. He found it very easy to understand. So he kept reading it, and also started going to church. Very soon he accepted Jesus Christ as his Savior. Rev. Dr. Stephen Tong 唐崇榮牧師, a well-known evangelist，invited us to distribute JMSJ at Huaien Tang Church, Taipei, where he was giving a series of lectures on the Bible from March to June 2007. 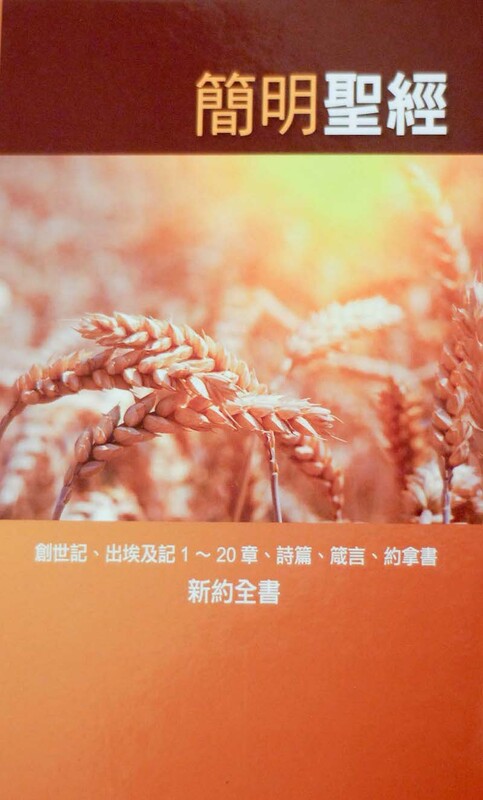 May this Bible help Chinese-speaking Christians better understand God’s Word and grow to bring Him glory. And may this Bible lead many Chinese speakers to the Lord! Thank you for visiting the official website of Tucson Chinese Bible Society. As a ministry of Tucson Chinese Christian Church, we are dedicated to the Chinese translation and distribution of The Holy Bible. 翻譯特 色： 新譯, 好讀, 好懂. 電話: 800-624-3504; 地址: 21 Ambassador Drive, Paradise, PA 17562. 電話: 626-307-0030; 地址: 9386 Telstar Ave., El Monte, CA 91731. 02-2393-8583;15 Hang Chow S. Road, Sec. 2, Taipei 106. 800-624-3504; 21 Ambassador Drive, Paradise, PA 17562. 626-307-0030; Address: 9386 Telstar Ave., El Monte, CA 91731. 您如果受到聖靈的 感動，願意幫助我們的事 工，您可以禱告，求主讓更多的人知道、使用這本好讀、易懂的《簡明聖經》，使世界上每一個角落的中國人都得到祂的福音。 您如果願意在財力上支持我們免費贈 送《簡明聖經》給需要幫助的人(包括中國大陸裡面的)，請把奉獻支票開給Tucson Chinese Christian Church, 在支票的左下方註明For Chinese Bible Project, 並將支票寄到：Tucson Chinese Christian Church, 627 NE 22nd Ave, Canby, OR 97013. If you would like to support our ministry in distributing free Jian Ming Sheng Jing to the needy (including those in Mainland China), please make your check payable to: Tucson Chinese Christian Church, with a note in the memo blank: For Chinese Bible Project, and send it to: Tucson Chinese Christian Church, 627 NE 22nd Ave, Canby, OR 97013. The Church will send you a receipt at the end of the year for the tax purpose. The copyright of this material belongs to Tucson Chinese Bible Society. To proclaim the gospel of Jesus Christ, the material is provided for your personal use only. Please indicate the source when quoting. Without prior written agreement with Tucson Chinese Bible Society, the material may not be reproduced for profit in any form or by any means.